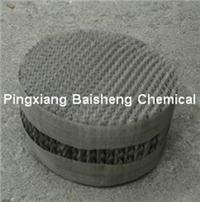 700CY Wire Gauze Packing is used for fine chemical, flavours, isomers separation. The separation of thermally sensitive materials, pilot and laboratory columns. Used for fine chemical, flavours, isomers separation. The separation of thermally sensitive materials, pilot and laboratory columns. Reform exixting column for increased performance.